With a population of over 1.3 billion and a rapidly growing middle class, there is huge potential for western businesses to win over Chinese consumers. Despite the potential, succeeding at digital marketing in China has proven to be a challenge for many western brands. For your digital marketing campaign to succeed in China, you need to consider a few big differences. 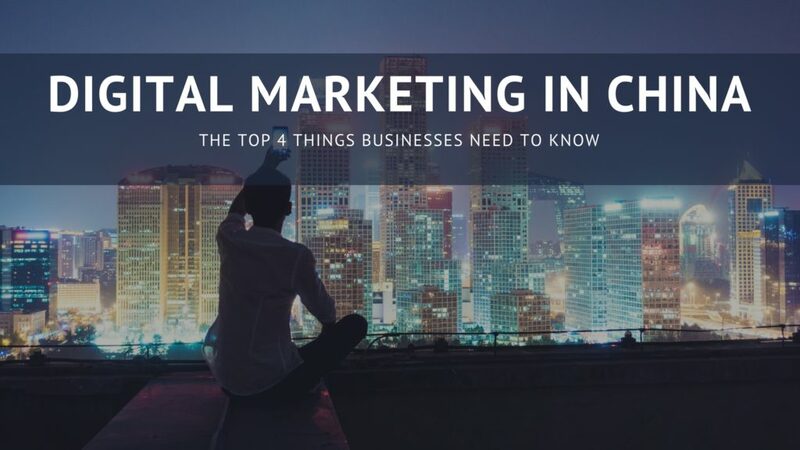 One of the first things brands notice as they look into expanding their digital marketing in China is that practically none of the tools and channels they rely on in the West are available there. China’s great firewall keeps out western digital marketing mainstays, such as Google, Facebook, and Instagram. Its isolation from western digital media has led to the development of a completely unique digital ecosystem, with platforms that match much of the functionality that internet users in the West are familiar with. Instead of Youtube, there’s Youku; instead of Google, there’s Baidu; and instead of Twitter, there’s Weibo. However, it’s unfair and overly simplistic to see China’s digital marketing landscape as being filled with copycat products inspired by western companies. For example, the mobile platform WeChat not only has no true analog in the West, it has also pioneered advances in mobile payments and in-app commerce that Facebook is now integrating into its own products. For businesses looking to break into China, understanding its completely unique digital ecosystem is a must. To say that China’s market is “mobile-first” isn’t so much of an understatement as it is a complete misunderstanding. China’s market is mobile. The portability and affordability of smartphones have made them the primary device that Chinese rely on for day-to-day computing needs. Mobile devices are becoming increasingly integrated with daily life in China, with more and more everyday tasks and activities taking place on hand-held screens. The best example of this integration is WeChat. What began as a social networking and communications platforms has grown into what is now an unavoidable part of life for many Chinese. WeChat combines a wide range of functionalities that are found in multiple apps in the West, such as group discussions (Whatsapp), status updates (Facebook), shopping (Amazon), and payments (ApplePay). WeChat’s “Wallet” feature even allows you to shop for insurance. It’s such a large platform now, it even has its own apps. Third-parties can now develop “mini-apps” for use within the greater WeChat platform, which provides businesses a lot of flexibility for implementing innovative marketing campaigns. Even if western businesses don’t take advantage of all WeChat’s unique features, they must set up an official WeChat account to succeed in the Chinese market. One outcome of China’s mobile integrated society is the prominence of online to offline (O2O) marketing, and no O2O marketing phenomenon is more widespread than that of the QR code. Although they’re widely considered to be useless by marketers in the West, QR codes dominate the marketing landscape in China. Paying for a meal out, renting a bike, applying for a job, or even giving money to street beggars, QR codes—the variety of applications that people have adapted the use of QR codes to is impressive. And the growth of the QR code doesn’t seem to be slowing down anytime, with roughly a third of China’s mobile transactions (which is worth $1.65 trillion) making use of them. Customers in China are so accustomed to the QR codes, that choosing to not use them could present a considerable loss in revenue. More and more Chinese are ditching their wallets at home and prefer to use their mobile devices to pay for everything—even offline purchases at stores and restaurants. One last thing to remember is that the Chinese market is in a constant state of flux. Chinese society is undergoing rapid shifts, and technology is advancing at an increasing pace. Along with these changes, consumer behaviors and preferences are also shifting. In 2016, live-streaming video experienced a huge boom, becoming the hottest new internet trend in China. But less than a year in, the government issued bans and tighter regulations that are affecting some of the web’s biggest live-streaming platforms, potentially putting a damper on further innovation in the video-streaming space. In order for marketing to keep pace, digital marketing strategies in China have to be agile. To succeed in the Chinese market, businesses in the west have to stay up to date with its frequent shifts. Want some professional help expanding your marketing to China? Contact us! Seth got started with digital marketing as a university student building e-commerce websites. He was so busy thinking about how to market the products that he never got around to making any prototypes. Now he is the managing director of MWI’s UK office, where he creates client marketing plans and oversees business development. After a long day spent working on client strategy, Seth can usually be found playing jazz bass.